time away: Ex- Carcel. . . ex jail. Ex- Carcel. . . ex jail. Nadia and I struggled up the cerro conception. Beyond an old decrepid concrete wall, we heard the sound of drumming and guitars. On the curb at the foot of the hill, painted under a small mural in bright yellow letters were the words ¨ex-carcel¨(ex jail) with a little arrow pointing toward the left of the wall. Curious, we hurried up and around the curvy wall and through the imposing painted gates; passing a small cafeteria on the left and 2 small tourist offices on the right. 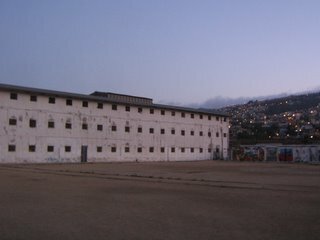 We entered the courtyard looking to the left and seeing a 3 story whitewashed wall with rows of small barred windows facing the center courtyard, a jail! The music was louder. Immediately we walked toward the building and crept through the small door on the right. 4 drummers, an acoucstic guitar player and a keybord player were bashing away, swaying back and forth with their eyes closed. I stood, smirking and listening in the dark dank hall, while trying to read and understand the writing on the wall plaque explaining the history of the space. 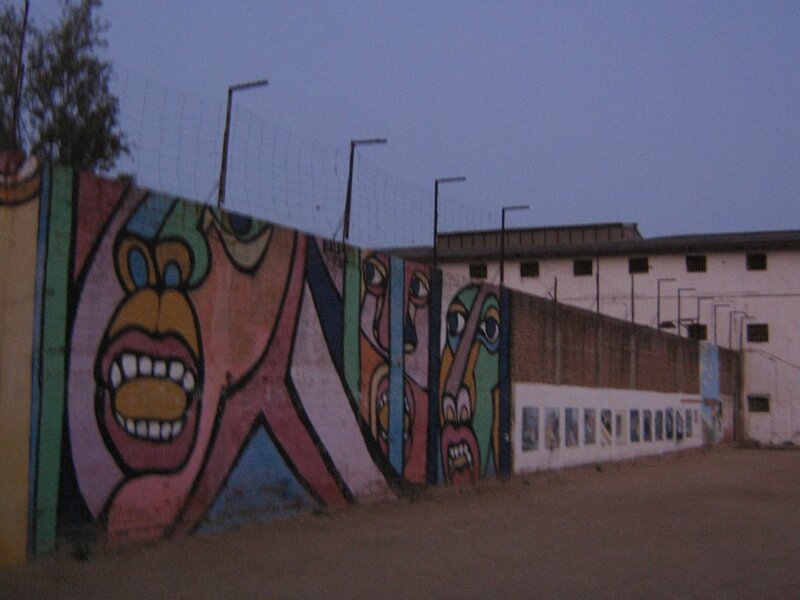 In 1999 when the jail was abandoned, the city government converted it into a community art center. Now the Chilean department of culture is responsible for maintenence and upkeep. It was mindboggling to be in a place that once stood for confinement that now stood for expression and freedom, what an interesting contrast! Nadia walked over and started bouncing to the rhythm of the drums and taking photographs. Then we wandered around the first floor of the jail house and through the exit on the other side, only to encounter another group of drummers practicing samba music. However, over the sound of their drums we heard the buzzing of table saws, as we continued toward to the back, we saw a complete wood shop with 3 shirtless guys manufacturing tables. We turned around and walked up the fire escape to the 2nd floor of the jail house, and entered an old cell. . . there were still old magazine cut outs of scantily clad women pasted on the wall near the ceiling, where the 3rd bunk was. Amazing. We returned to the ground and walked through the first floor past the first band again. It was time to explore the rest of the grounds. Opposite the jail house is probably what used to be the administrative quarters. Now those spaces are a museum with a permanent exhibit displaying the history of the jail, and a theatre showing independent and experimental productions. . . tonight was Nimia (something about nymphs I think.) A guy was juggling in the lobby. On the other side of the administrative building is a series of shops. Apparently artesans, working with recycled materials, can rent space for $10 a month. Though the spaces were not busy when we were there (its summer and many people are away), palm tree bark and leaves were poking out the window of one shop and, another was filled with plastic and glass bottles and old aluminum siding that were to be used for recycled crafts. One space had large colorful mandalas on the wall with the words, ¨historio de la cuidad y cultura¨ stenciled above. 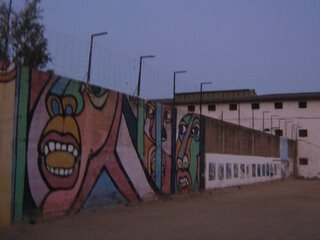 The entire wall accross the back of the jail complex was covered in a mural painted by 80 local children from December 2004. Other nooks and crannies around the grounds have interesting graffitied spray paint murals. Nadia and I sat down with 2 guys at a table in a kitchen (located close to the entrance)There was a native indiginous Quecha woman cooking and her weaving covered the wall, she offered some juice and explained that people who need to can eat for free. She sells her crafts at markets. This kitchen was her work space. I was just dumbfounded that a jail could be turned into a community center. 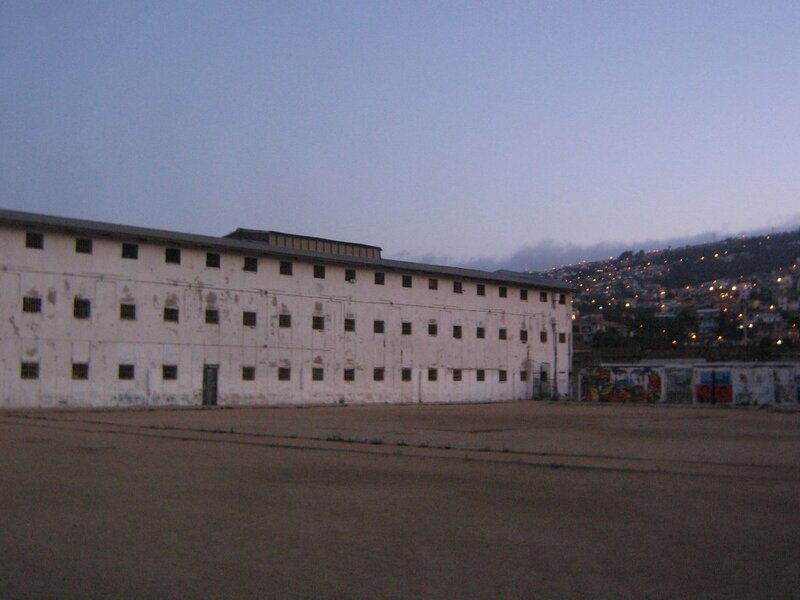 I can see how a kid would think that it´s cool to be practicing music in a jail, spraypainting murals on an old wall, and coming there at night to see events. This place provides safe space for creative development, without sacrificing ¨coolness¨ that so many teenagers need to feel authentic. When I mentioned that I went to ex-carcel to Molly (who I live with) she mentioned that it is run by a convict that used to be incarcerated there. What if Bush had suggested that we convert jails to community centers in his state of the union address? We have a long way to go.